Toronto, Ontario--(Newsfile Corp. - January 10, 2019) - Aurania Resources Ltd. (TSXV: ARU) (OTCQB: AUIAF) (FSE: 20Q) ("Aurania" or the "Company") reports up to 9% copper with 185 grams per tonne ("g/t") silver - from grab samples of rock in streams draining a doughnut-shaped magnetic feature identified as the "Tsenken-A" porphyry target in magnetic data from the Lost Cities - Cutucu Project ("Project") in southeastern Ecuador. 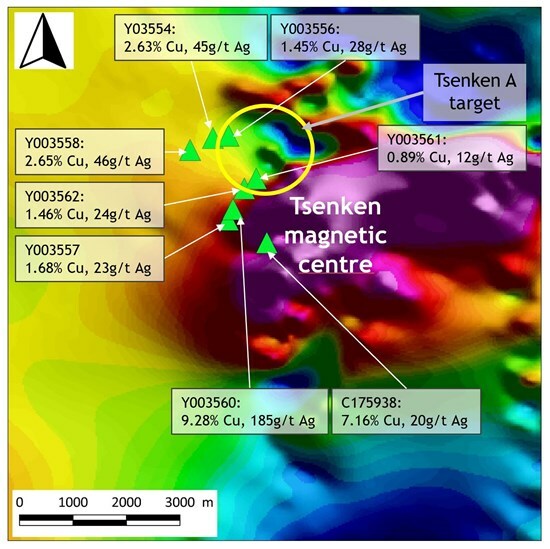 Aurania's Chairman and CEO, Dr. Keith Barron commented, "The significance of these high-grade copper results is that they suggest that the highly magnetic feature at Tsenken - rather than being one very large, broad target area - is resolving into a cluster of discrete magnetic features, each of which could be a porphyry body. So, rather than having one potential source of copper at Tsenken, we probably have multiple sources that underscore the mineralization potential of the target area. The resolution of the magnetic feature at Tsenken into a cluster of discrete bodies is leading us to look at the other big magnetic features along trend of Tsenken - the Kirus, Jempe and Awacha target areas - as potential porphyry clusters too." The high-grade samples contain malachite, chrysocolla, tenorite and chalcocite with minor cuprite. A total of 8 samples in this area returned grades ranging from 0.9%-9% copper. These secondary copper minerals are hosted in distinctly bedded sedimentary rocks, some of which have a tuffaceous component. These high-grade grab samples were found in streams that drain an area that has a distinct geophysical signature on the edge of the large magnetic feature at Tsenken. Magnetic data over the Tsenken-A target, acquired in the geophysics survey flown in late 2017, defines a circular area of relatively low magnetism surrounding a core of strong magnetism (Figure 1) - the type of signature expected from a porphyry system in which the central, potassium-altered, magnetite-bearing core is enclosed by "phyllic" alteration in which magnetite has been altered to non-magnetic minerals. Copper mineralization at Tsenken-A has been found in an area of 3km by 1km in extent (Figure 1, Table 1). The current exploration concept defines a porphyry body intruding a sedimentary and volcano-sedimentary sequence, with fluids from the porphyry infiltrating and mineralizing the enclosing permeable sedimentary and volcano-sedimentary rocks. The Tsenken magnetic feature lies 8km from the Kirus magnetic feature, where copper grades of up to 5.4% with 54g/t silver were obtained, and 12km from Jempe, where grades of up to 3% copper and 47g/t silver were reported in a press release dated October 4, 2018. Figure 1. Map of magnetic data from the Tsenken target showing the location of the high-grade rock samples. Data for each sample includes the alpha-numeric sample number and grade for copper ("Cu") and silver ("Ag"). Magnetic data are illustrated by colour, dark blue being the least magnetic areas and purple/pink shades being the most intensely magnetic. Rock grab sample positions are shown as yellow triangles. Table 1. Copper and silver assays from grab samples of rock in streams in the "Tsenken A" target area. The Company is awaiting one more permit to clear the way for scout drilling of the epithermal gold-silver target at Crunchy Hill. This permit is within the jurisdiction of the Ministry of the Environment, in which the new minister was appointed in early-December. Management has met with the new Minister and the Undersecretary of the Ministry of the Environment and has been assured that the scout drilling permit will be issued shortly. The selected drill contract company has had its technical staff on site and is ready to mobilize as soon as the final permit is received for drilling at Crunchy Hill. ALS's preparation lab in Quito sent the prepared samples to its analytical facility in Lima, Peru for analysis. Approximately 0.25g of rock pulp underwent four-acid digestion and analysis for 48 elements by ICP-MS. For the over-limit samples, those that had a grade of greater than 1% copper and 100g/t silver, 0.4 grams of pulp underwent digestion in four acids and the resulting liquid was diluted and analyzed by ICP-MS.
ALS reported that the analyses had passed its internal QAQC tests. In addition, Aurania's analysis of results from its QAQC samples showed the batches reported on above, lie within acceptable limits.